Valentine’s Day is just around the corner, and we love making Valentine’s Day arts & crafts at The Blue Elephant! 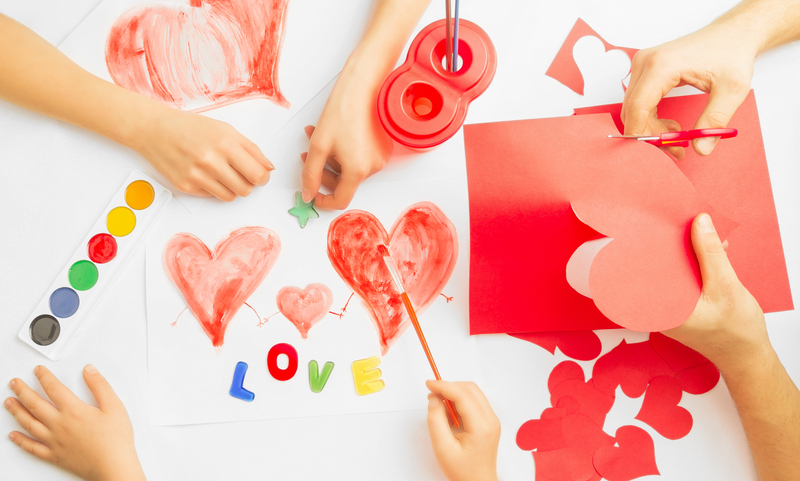 As an early childhood education center in Frisco, TX, one of our favorite activities during any holiday is crafting, but Valentine’s Day holds a special place in our heart. Plus, it’s a great way to have fun with kids at home while also encouraging them to express themselves and learn. To help you get some ideas for Valentine’s Day crafts with your little one, here are a few of our favorites! 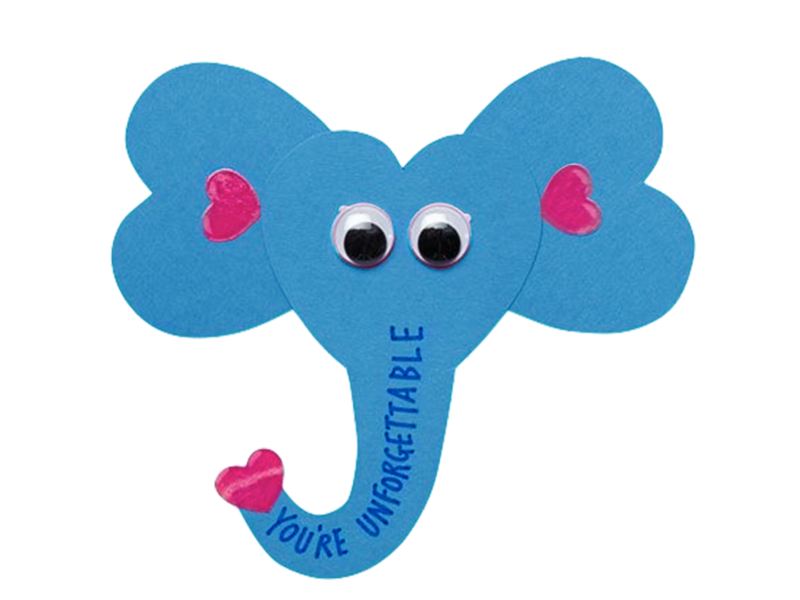 It’s pretty easy to see why this elephant Valentine’s Day card is one of our favorites here at The Blue Elephant! Plus, it’s super easy to make and is a unique card to hand out to classmates. Start with blue construction paper and cut out two large identical hearts for the elephant’s ears. Next, cut a piece of paper in the shape of the elephant’s head & trunk, as shown. Now, take the pink construction paper and cut out three small identical pink hearts. These will go on the inside of the ears and the end of the elephant’s trunk. Using your glue stick, glue the small pink hearts onto the ears and trunk as shown. Next, use your glue stick to attach the ears to the back of the head. Using Elmer’s glue, place two small dots of glue in the middle of the head and attach two googly eyes. Lastly, write a cute Valentine’s Day message on the elephant’s trunk, and ta-da! Now you have a truly unforgettable Valentine’s Day card. In a world of technology and instant-everything, there’s a lot to be said for a thoughtful handmade Valentine. Plus, it’s a great way to promote creativity and fun! Start with a piece of 8.5 x 11” construction paper. Fold the paper in half, “hamburger style” and cut down the middle. Now you have two pieces of paper that will become your cards. Fold each piece of paper in half to make a Valentine’s Day card. Cut out little paper hearts and glue them to the card. 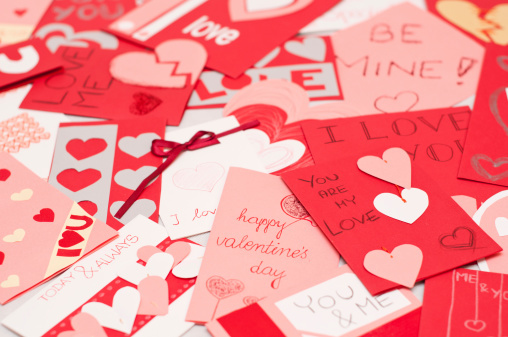 Using your markers, colored pencils, or crayons, decorate the card and write a cute Valentine’s Day message. Feel free to bedazzle your Valentine’s Day cards with glitter, ribbon, stickers, or whatever other craft materials your heart desires! This Valentine’s Day craft is one for parents to make and for kids to enjoy! These strawberry & watermelon heart kabobs are perfect for a kids’ Valentine’s Day party, or even just a special after-school snack. Plus, they’re a healthy alternative to the usual Valentine’s Day candy. Start by cutting your watermelon into small cubes or rectangles. The watermelon cubes should be slightly larger than your cookie cutter. Cut each watermelon cube into the shape of a heart using the heart-shaped cookie cutter. Set the watermelon hearts aside. For the strawberries, start by washing them a colander in cool water and pat dry. Remove the strawberry stems and leaves. Cut a rounded v-shape in the top of each strawberry where the stem used to be. Next, cut each strawberry in half the long way so that the cross-section looks like a heart. Round out the edges of the strawberries to perfect the heart shape. 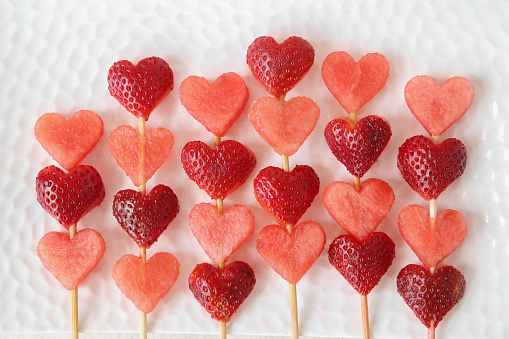 Finally, place your strawberry & watermelon hearts on the skewers, and voilà! Your healthy & festive Valentine’s Day snack is served! 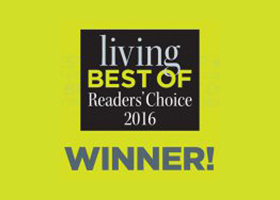 Visit The Blue Elephant Private Preschool in Frisco, TX! If you have any questions about The Blue Elephant Learning Center, or if you’d like to know more about our children’s learning center, please feel free to contact us. We also encourage you to consider taking the opportunity to enroll and join our family! From all of us here at The Blue Elephant, Happy Valentine’s Day!